hand painted cushion cover, on raw silk, silk and cotton set against rich brocade border. All themes follow indian -rajasthani miniature paintigs. For base- Raw silk, silk & linen. For border- brocade & zari. 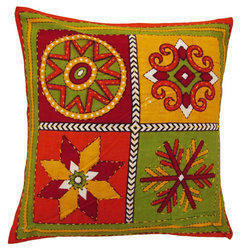 Cotton Canvas Printed Cushion Cover, Size: 16x16"
This cotton cushion cover is made of cotton. It is graced with beautiful hand batik. These traditional and ethnic creations are made by bengal rural artisans. 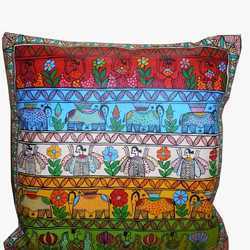 Indian enthnic hand embroidery decorative silk pillow cushion cover set of 5 pec. Avail from us wide range of Hand Painted Cushion Cover. These cushion covers are used for enhancing the look of pillow cushions in a bedroom. These cushions are made from high quality & are available at reasonable prices. Cream Colour Shinning Cotton Designer Hand Painted Cushion Cover, Size: 16/16". Fevicryl hand painted cushion cover. Heavily hand painted cushion cover and traditional cushion covers with detail treatment for outstanding looks. A perfect match for every interior or sofa.